Nearly every modern game has RPG elements woven into it in some shape or form. Equipment, dialogue choices, character classes and skill trees. The problem is, most of these games make poor use of their RPG mechanics. Let’s look at two games I played and completely loved from the past 12 months: Assassin’s Creed Origins and God of War as an example. Both of these games have equipment you need to buy/pillage/find, they also have ability trees that the player slowly fills out as the games progresses, making them more powerful and giving them access to a more varied array of approaches to any given situation. In theory, this makes you better equipped to deal with the challenges of the later game. Why they’re consistently a bit of a letdown for me personally is because they fall into the hole that most modern games fall into: There is no real choice to you progress. 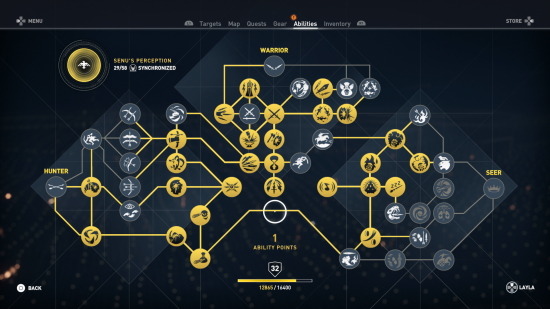 While developers can present these skill trees or webs or grids in all manner of visually appealing ways, they ultimately feel like checklists. They’re a collection of abilities that, given enough time, you can access in their entirety by the time you’re hitting the final quarter of the game’s story. By the time I was two thirds the way through these games, I was back stocking XP and skill points with no use for them, as I’d bought every skill, talent and ability available to me. I’m still free to play the game how I please, and prioritise the abilities I most want in the early game, but that’s about as far as the choice goes. Every Kratos, Beyek or Lara feels pretty much the same by the time you see credits. Given, these are action games that merely have RPG elements to create a slow progression and bottleneck certain areas of the game. The more pure role playing experience I’m talking about come from games that build themselves around their progression system. And In my opinion, Bethesda are the best at this. It’s why I put more hours than I’m willing to count into both their Elder Scrolls and Fallout franchises. Thus we arrive back at Fallout 4. While not as adored by the press as the two games that came before, I continue to love the game in spite of its problems. And this is mostly due, you guessed it, to its customisation options. The player character is a true blank slate, dropped into an open world with little more than a stat allocation and a blue jumpsuit. The task the game lays forth is to make your way through the game’s many narratives and challenges in a way that suits you, ranging from subtly to brute force. 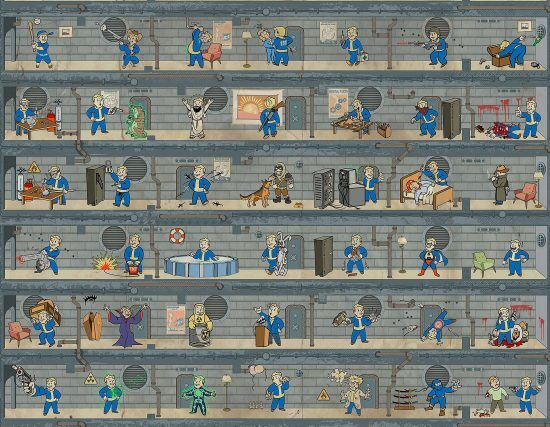 The skill page within Fallout 4 is huge. Each of the six primary attributes has 10 skills associated with it, increasing in power and requirement cost as they go down. Each of those skills can have anywhere from two to six levels that increase the effect of the skill, as well as add additional benefits. 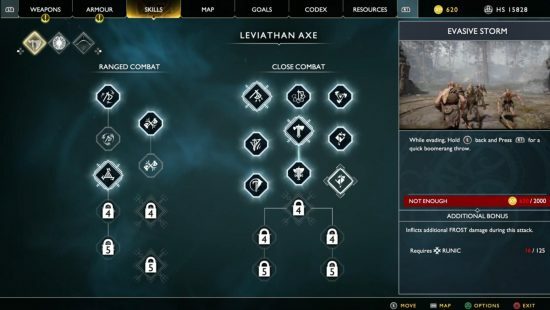 Each time you gain a level, you get one skill point to either allocate into one of the attributes itself, improving your base stats and unlocking a new skill on the tree, or spend it on a level of one of the skills themselves. I played over 110 hours of my first character in Fallout 4, reaching level 63. While I created a uniquely powerful stealth/sniper character in this time, I hardly scratched the surface in terms of the number of skills available to me. Playing the game again now, I have taken a totally different approach to combat and how I’ve built my character, focusing on melee, survivability and a heavy reliance on chems. Consequently, I am having a completely different experience with the game and still enjoying it all over again through a different lens. If you imagine I could potentially give this another 100 hours and still have different builds to explore. It makes a game like Fallout less of a standard game, and more of a framework for the player to create their own game. It’s pat of the reason so many people obsessed over the settlement building features in the game. If there was one game I feel manages to capture the essence of character creation even better than this though, it would be Skyrim. Like Fallout, there are a ton of abilities, all of which have a number of skills associated with them. With each level up, the player is given the opportunity to spend a point in one of these skills. What makes Skyrim fantastic though is that is requires no forward planning or thought. In Skyrim, you drop into the world, pick your race and are let loose to play however you want. You build your skills up by simply using them. There are no classes, you have access to to pretty much any ability in the game and the more you use a said ability, the better you get at it. It’s a genius approach. 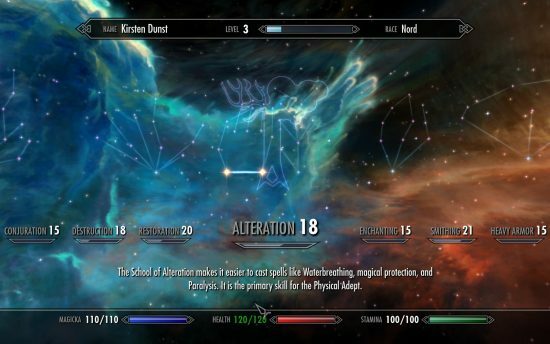 While the idea isn’t perfected in Skyrim and some degree of abuse is easily available to gain quick and easy levels using certain magic types constantly as you wander the world. It’s the system that keeps me coming back to the game over and over again. The biggest weakness of the system in Skyrim, if I had a poke a hole in it though, would be the fact that you can easily slip into familiar territory. As you near the peak of a particular skill, you start raising other skills to get more skill points. And before you know it, your two weapon brawler has become another illusion wizard/assassin. 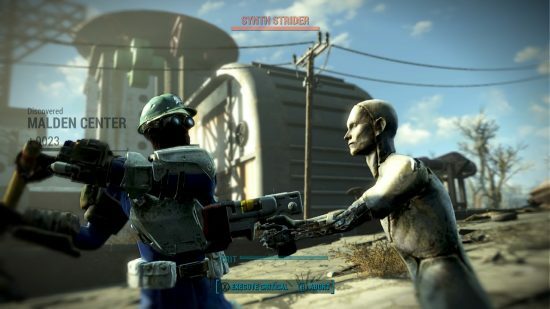 There is much less of a sense of commitment in the game that comes with Fallout 4. It’s these systems that make me return to these games over and over when I have a ton of brand new games on my hard drive I could be playing. It’s one of the things I most lament about the path that many MMOs have gone down since the days of Vanilla World of Warcraft. Character customisation, especially in an online multiplayer game is an important element, when a group needs to gel and make up for one another’s weaknesses. The ability for every class in a game to switch its role on the fly takes a huge chunk out of what made those games so appealing to me. In the end though, RPGs are about throwing yourself into a world over and over, rarely having the same experience twice. It’s why I have such a passion for table top RPGs and why I’ve put so much time into the Pokemon franchise. Slowly building up characters and teams from nothing is something that has always brought with it a huge sense of accomplishment and satisfaction. It’ll always be the thing I obsess over, no matter what. Hell, it was the thing that got me deep into Fifa when that still cared about anything outside of Ultimate Team. Posted on July 13, 2018 by WooderonPosted in Features and/or Ranting:, Video GamesTagged bethesda, customisation, fallout 4, god of war, mmo, rpg, skyrim, Video Games, world of warcraft.